Ergonomic Chairs offer comfort while doing repetitive work. Series i20 Chairs are desk height models with seat adjustment of 18.5-22.75 in. above floor. Series i23 offers seat height adjustment from 22-29.5 in. and includes footrest ring for leg support. Available in ESD configurations for static sensitive areas, both series provide stable body support while enabling user to maintain dynamic posture through movement of chair, rather than body twisting. Chairs include 5 arm aluminum base with dual wheel braking casters. BREA, CA-Designed as the perfect complement to workbenches or workstations, IAC's new ergonomic chairs are built to withstand the punishment of constant, everyday industrial use. IAC chairs are fully adjustable to suit the needs of the user, the workstation and the task. IAC seating is designed to provide stable body support while enabling the user to maintain a dynamic posture through movement of the chair - rather than body twisting - during tasks and activity. At home in manufacturing environments, IAC chairs feature a strong and stable five arm polished aluminum base with dual wheel, braking casters designed for concrete and other hard floors. The fabrics used have been selected to stand up to repeated cleanings. And because ergonomics are so important to providing hours of working comfort IAC chairs provide seat height, back height, plus seat and back angle adjustability. Two series are included in this introduction, both available in standard and ESD models. The i20 Series chairs are desk height models with seat adjustment of 18.5" to 22.75" above the floor. The i23 Series are taller, mid-height chairs with seat height adjustment ranging from 22" to 29.5". These taller chairs include an ergo footrest ring to maintain comfortable posture and leg support. Both series offer optional adjustable arm rests that are available with matching fabric upholstery or basic black polyurethane surfaces. Both the i20 and i23 Series are available in ESD configurations for use in static sensitive areas. These models include a 1/2 Megohm current limiting resistor designed to protect both the operator and the assembly should an ESD event occur. A spring-loaded clip in back upright makes connection between back and control mechanism. Special foot rings provide metal-to-metal contact with the cylinder. ESD chairs are tested for continuous path to ground from seat and back, before shipping. 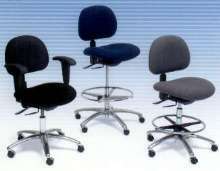 Interested parties are able to view the IAC seating selection on the company's online catalog at www.iacindustries.com. Based in Brea, California, IAC Industries is a prominent manufacturer of technical furniture (production workbenches, workstations, and related products) for companies performing assembly, testing, repairs, inspection and related applications across a wide spectrum of industries. IAC products are 100% made in the USA by Union Labor, and are sold worldwide. IAC Industries currently offers the widest range of workstations, workbenches, seating, and workstation-related accessories available from a single manufacturer. Products meet many industry and military requirements for static control in electronics assembly and testing. For more information, contact IAC Industries at 714-990-8997 or benchsales@iacindustries.com.